Food Prep. Emergency Kits. Crisis Planning. BOBs. I've spent a LOT of time reading about prepared pantries, pantry design, emergency planning, etc. 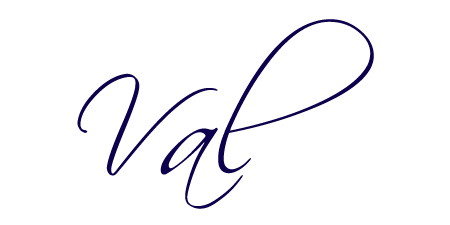 Though I see the value in "prepping," I'm maintaining my determination to remain balanced. So, what is a prepared pantry? How much is too much? I'm thinkin' many folks go overboard and spend money and time on prepping at the expense of other responsibities. Yet, I realize by looking around me, myself included, most have done nothing in the area of preparedness. I want to change that and develop the mind set that I can't rely on the grocery store around the corner to always have what I need. So, let's strike a balance. I want to challenge you to take a look at the supplies you have in your home, which I'm betting is very sparse, and evaluate just how prepared you really are for a crisis…whether it be an act of God like a winter storm, hurricane, flood, or an every day crisis like the loss of income through job loss or cut backs. No one expects a crisis to come. The balance comes when we trust God to take care of us while we prepare on our end – to be ready for a crisis. We don't fret. We don't overdo it. We don't imagine disaster around every corner. We prepare using our common sense using whatever resources we have available. Then we go live our life. We don't focus on disaster. That said, I believe it to be a good idea to prepare our home in the event of crisis. My goal is to have 30 days of a food and water set aside. Just in case. I will rotate my food store to be sure it all is fresh, safe, and usable. I will use several different types of food storage, and find the least expensive way to build my food reserve. I ran across this site – oh boy! It's very intriguing to say the least. Chef Tess Bakeresse is a food prep website. You've heard of "bed in a bag"? Chef Tess shows us how to prepare complete "meals in a jar". These are meals that we can store for 5-7 years. 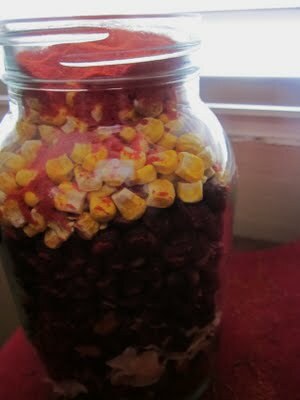 Using Quart Mason Jars and freeze dried food, she prepares meals ahead that only require heat and water. 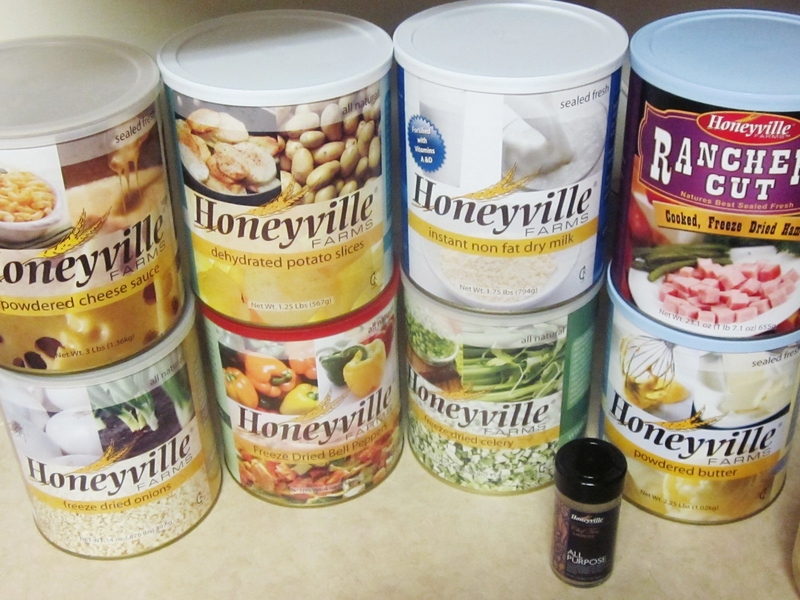 She uses Honeyville Farms for her freeze dried ingredients. 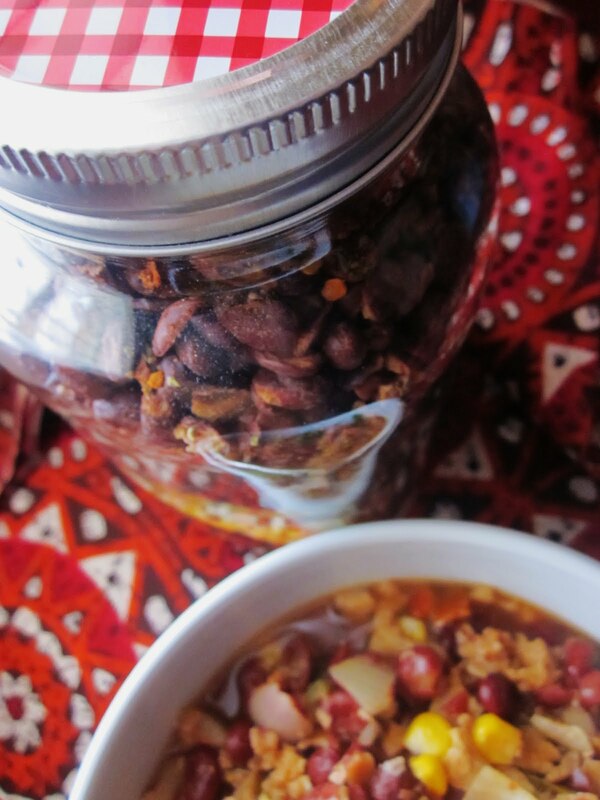 Here is one of her meals in a jar – recipe, cooking instructions, and pictures. Chef Tess says, "This is a recipe I made from an old classic for Taco soup. It's adapted using instant beans. Instead of taking hours to cook in a crock pot, it takes just about 20 minutes! I'm super excited about it! Can you tell?! It can fit conveniently in a quart size jar so it's perfect for food storage!" When you get to the tomato powder, just shake the jar so it works its way into the cracks. To prepare taco soup: place contents of jar in a gallon pot in a solar oven or on the stove. Add 2 quarts of water and simmer 20-30 minutes until veggies are tender. Serve with nacho chips, sour cream and salsa if desired. Have you considered putting up food in case of a food shortage or crisis? If you were to put up for the winter, what would you buy or put together? Do you have any personal experience that you could share? I'm just beginning this journey so I'm open to suggestions. DIY Cures? Is it Possible to Live Without Traditional Medical Assistance?